An Apple a Day makes the doctor say hooray! 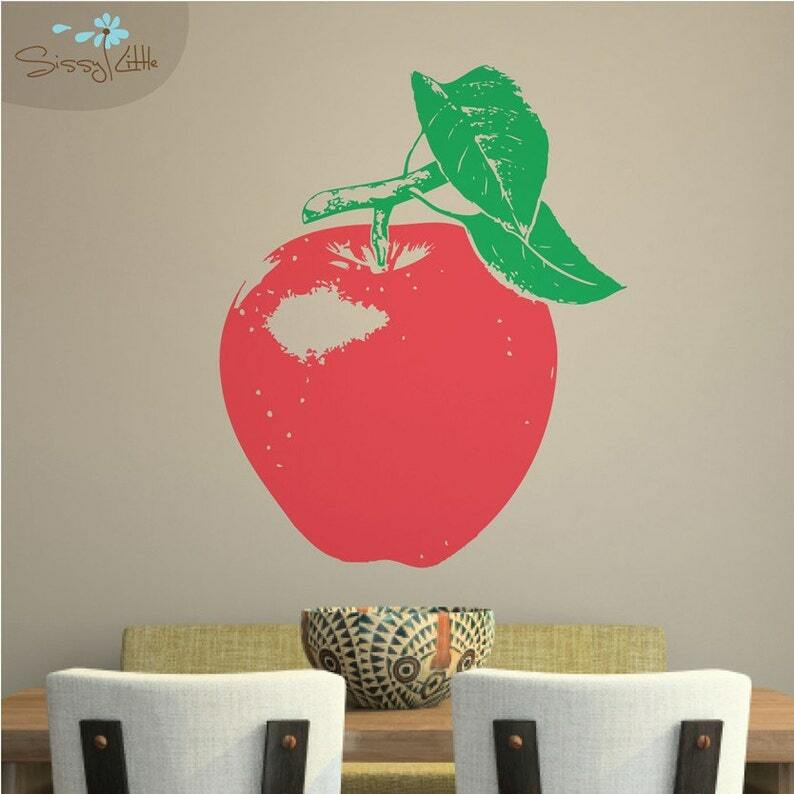 Take your wall to a new level with our modern apple wall decor design. Or create your own signature style by choosing a non-traditional color scheme. Choose up to 2 colors from the choices shown. IMPORTANT: Enter color preference in the ‘message to seller’ box at checkout. If no colors are selected, you will receive the colors shown in the listing’s main picture. Decals can be applied to any clean, smooth, flat, or semi-textured surface. Place them on walls, doors, windows, furniture, or anywhere you can imagine. Please realize, however, that the vinyl cannot be repositioned. Step-by-step instructions will be included with every design. A free squeegee and a practice decal will also be included. Installing our decals is a relatively easy task. Designs with a greater number of parts or that are larger in size will take more time to install than simpler designs. If you have any questions about how to install your Sissy Little design, feel free to contact us at (support@sissylittle.com). Not all wall vinyl is created equal. Lesser quality vinyl fades more quickly, tends to shrink over time, and is more likely to chip or peel paint when removed. We use only the industry’s leading removable self-adhesive vinyl in our products (Oracal). Please allow 1-5 business days for us to custom cut and creat your decals. Orders ship via USPS Mail and are usually received within 3-5 business days for domestic orders and 12-15 for international orders. All of our designs are created, manufactured, and shipped from Charleston, SC. We offer a 100% money back guarantee. If you are unhappy in any way with your purchase, please email (support@sissylittle.com) within 7 days of receiving your order, and we will gladly refund your money. We do ask that you return the item to us regardless of its condition. Have you installed a SissyLittle design? Send us a video, a few pictures, or a note to tell us about your SissyLittle experience to (feedback@sissylittle.com). Have a great idea for a new SissyLittle design? Email us at (ideas@sissylittle.com). This is so adorable and came with amazing directions it’s so beautiful my son loves it. I love this saying - I ordered the 1st time in 2014 - to put with my family's/kids pictures. We renovated our house and repainted the hallway so I re-ordered it to put back on the wall with my family's/kids pictures. Both times the order was shipped on time/quickly and arrived in excellent shape. Looks fantastic on my boys bedroom wall. Thanks! All orders are made to order at the time of purchase since they are fully customizable by color and/or monogramming. You may return your order within 30 days for an in-store credit only. You must return your order no matter the condition to get the credit. We will not provide payment for return shipping. If you have any additional questions please contact us. Orders ship via USPS within 5 business days of receiving payment and are usually received within 2-4 business days for domestic orders and 3-7 for international orders. All of our designs are created, manufactured, and shipped from Charleston, SC. Feel free to contact us (support@sissylittle.com) with any questions or concerns. Unfortunately our decals do not work on textured walls well. Please make sure you have flat walls when ordering your wall decals!